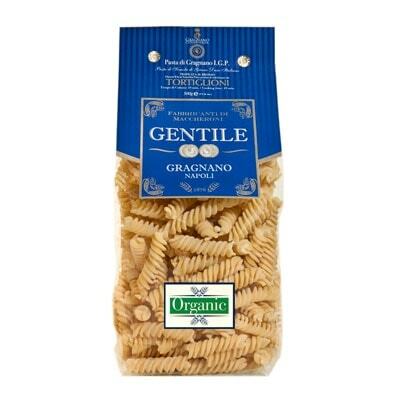 A type of pasta that closely resembles fusilli, this bag of Tortiglioni is from artisan pasta maker Gentile. Beautiful springy pasta, it is a very versatile noodle. You can serve it with any kind of sauce you can whip up. You can also just toss butter and cheese on it. Or if you prefer, bake it into a casserole with mozzarella or any Italian cheese you love. Prepare it for family dinners or any special occasion. There’s also the option of giving it away as a present for a fellow Italian cuisine enthusiast. Whatever the reason, it’s best not to dilly-dally. So take home a bag, or two, today!